UEA’s Climatic Research Unit (CRU) runs a research project into past climate data derived from “raw tree ring” chronologies, the ultimate aim of which is to obtain the most reliable chronologies of tree-growth and to make inferences about variations in climate for the last 200 years. This is the subject of appeal 156. The appellant, a climate change agnostic, suggested that CRU had deliberately selected tree-ring data to produce a preconceived and erroneous picture of tree-ring variations in a particular region (the ‘2006 Chronology’). He requested disclosure of the 2006 Chronology, accusing the UEA of publishing a report in 2008 that misinformed the public by failing to disclose relevant results that were adverse to the 2008 report’s findings. the chronology would inevitably have been misconstrued and misunderstood, and the public misled as to the scientific implications of the 2006 Chronology… If the chronology had been disclosed following the request, then even with suitable caveats, it would inevitably have been taken out of context and misused by individuals whose intention is to distort the climate change debate. The appellant contended that the CRU, in seeking to show that twentieth century temperatures were unprecedented in the past thousand years, had failed to produce chronologies that gave contradictory evidence. Under the statistical policies aimed at preventing both “false positives” and academic fraud, the CRU should have had to disclose the 2006 chronology as a “failed manipulation”. The Commissioner upheld the UEA’s argument that this information fell into the public interest exception to the Environmental Information Regulations, stating that disclosure of research in an incomplete or unfinished form could undermine and jeopardise the full value of the information and could also potentially prejudice the scientific rigour of ongoing climate change research as a whole. The Tribunal rejected the appeal and upheld the Commissioner’s findings that at the time of the request the 2006 chronology related to material “still in the course of completion” within the exception to the regulations. As far as the public interest grounds for the exception to disclosure was concerned, the Tribunal accepted the Commissioner’s view that the requested information would not serve the public interest since it was incomplete. Any contribution to public debate would clearly be better served by waiting rather than “prematurely publishing data by virtue of an EIR request that would much more likely result in further confusion and fuel controversy in an area which is already both complex and controversial. Whilst the potential for misleading results from selection bias is very great in this area is research, the premature disclosure of incomplete material “could equally contribute to the public being misled”. If it became apparent to overseas scientists that sharing ideas and documents at the informal pre-publication peer discussion stage could lead to their public disclosure, then it is very likely that this would lead to the exclusion of UK scientists from such international peer groups. Mr McIntyre argued that the relevant IPCC working group required that copies of unpublished literature cited in the First Order Draft be made available to interested reviewers, and that by submitting their article for use in the IPCC, the authors had consented to disclosure of the article. The Commissioner, again, upheld UEA’s position that the requested information came within the Environmental Information Regulations exception to disclosure, and the Tribunal agreed. Whilst they accepted the appellant’s arguments that the provision of the article for use in the IPCC draft report was made with the tacit acceptance of the authors, they decided against him on the public interest grounds in favour of avoiding un-adopted positions being exposed to public scrutiny even after drafting is complete. Such would have a chilling effect the sharing of draft research in the peer review process and could misrepresent the authors’ final publicised position. Thus the public interest in maintaining the exception outweighed the public benefit of disclosing the material. The UEA is a regular participant in FOI/EIR proceedings and David Hart has posted on previous decisions both in favour and against disclosure of requested material. But in both these cases one gets the sense that the Information Commissioner and the Tribunal were anxious to protect academic proceedings in this controversial field from the public gaze. It is hard to understand why it was necessary to strive so vigorously to fit the circumstances into the EIA public interest exemption. Surely the best way for UEA or any other institution to avoid potential embarrassment was simply to publish adverse results or papers when they first came to its attention, or in any event to cede to freedom of information requests when they arose? Certainly in the second case the Tribunal acknowledged that there was little difference between the draft article at the centre of the dispute and the final published version. So why continue to hide it? And in the first case, chronologies are always work in progress. As such, they form part of the broad disclosure obligations on the part of publishing authors. The public interest is surely better served by scientists being called upon to explain and defend their finished public research rather than allowing them to withhold potentially contradictory evidence. I agree with Rosalind’s comment. 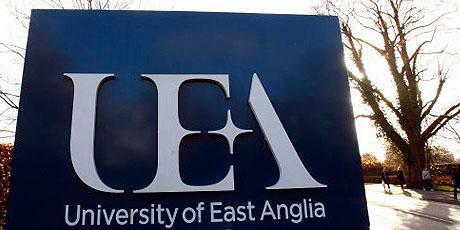 I’m not a climate change sceptic, and I have some sympathy for the UEA given its experiences. But the Commissioner and Tribunal should never accept an argument for withholding that’s premised on the public’s inability to understand the information, the fact that the information may just have been a stepping stone in the process, or that it may be used to distort debate. Those are the very antithesis of the reasons for transparency legislation. The conspiracy theorists will have a field day with this decision. Surely it would have been better to just “publish and be damned”! The worst crisis imaginable needs “certainty” not “maybe”. Do you remaining believers even know what the scientists agree on? It’s not that climate change WILL be a climate crisis, its agreement that it only “might” be a climate crisis. Science agrees that climate change is “real and happening and could cause a crisis.” Never have they said it is as inevitable as they love to say comet hits are. A climate crisis “IS” a comet hit of an emergency so how close to unstoppable warming will they lead us before they say the worst crisis imaginable is unavoidable? 28 years of “maybe” proves it “won’t be” a crisis and real planet lovers are glad not disappointed a crisis was exaggerated. The rest of you losers just hated humanity more than you loved the planet.